It rains all night but stops around 05h30. 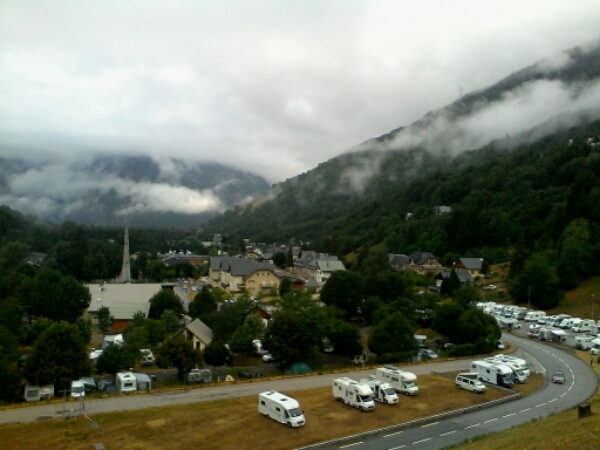 I am up, shaved, showered and on the way to Glandon as the sun starts making it’s way through the clouds. From Ferme Noemie I turn towards Allemont and this leads to the climb up to the summit of Glandon. From this beautiful village with a huge lake you climb to reach the village of Vaujauny. Then through a deep gorge before a really steep climb of 15% and steeper in places for around 5km to reach this plateau that I came back to and spent the rest of the day waiting for the riders to arrive. 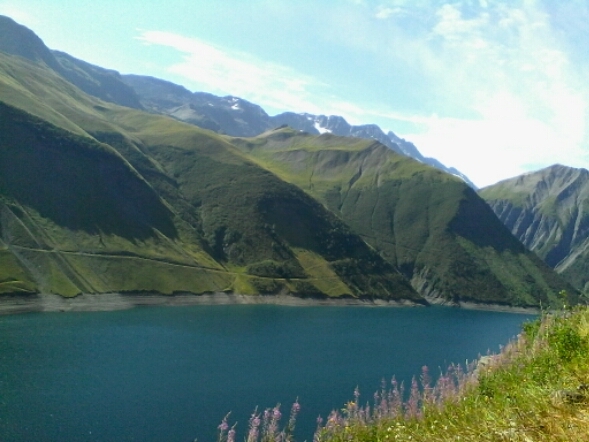 It was a further 5 kms to reach the intersection with the a Col de Croix de Fer to the right and the summit of the Col Du Glandon to the left. The summit was overcrowded and more people were arriving all the time so I pedalled back to the plateau and the view of this huge dam, L’Eau d’Olle. I had the whole area to myself for quite a long time and did get a few people staying. It turned out to be a great spot and far from the madding crowd. I now have a better idea of how many crazy fanatical people are on the mountain stages in particular. 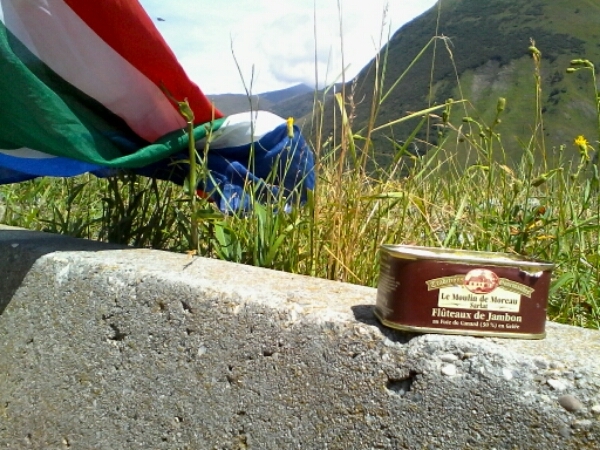 I had brought my supplies and made a nice brunch with a French treat of jambon with duck pate filling. I even had time to continue reading the signed copy of The Lanterne Rouge by Max Leonard and a nap in the bright sunshine before the action began. Another Saffa Wayne Van Huysteen arrived and stayed with me for the afternoon. He is also on a long ride and when we got chatting I discovered he was from George in South Africa. He was at school with Magna van Blerk nee Laubscher. She is married to a friends son and again I realised how uncanny coincidence is that I should meet him so far from home. He has a colorful life living in Australia and working the summers as a guide in New Zealand. Travel on safely Wayne until we meet again. 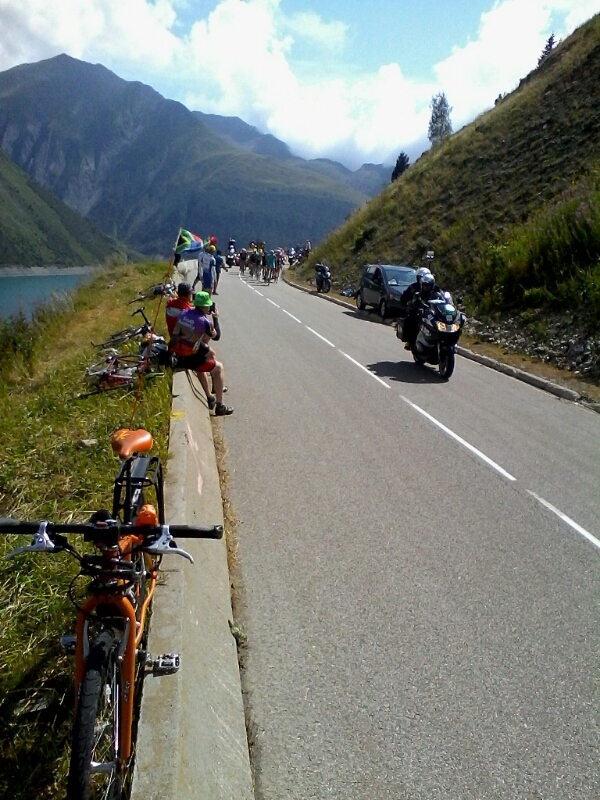 The riders came over the crest at such a speed and I had crawled over it, admittedly they are pro’s and my bike weighs two and a half times more. Still this is little consolation!!! 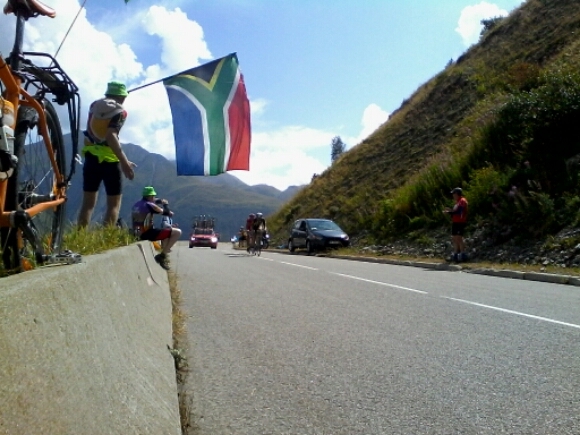 The bunch came by and in my excitement I did not get a photo being so busy screaming encouragement at our riders. 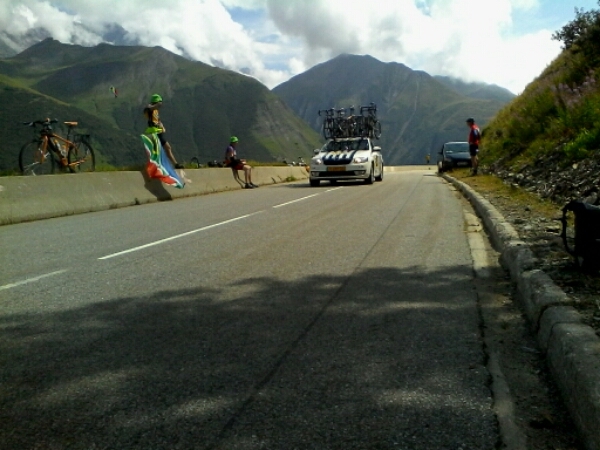 After the riders had all passed by I made my way back down the mountain and soon found a campervan with TV and watched the finish. A brave attacks on the the yellow jersey come to nought and Froome was safe for another day. Our MTN boys were in 2nd spot on the team GC so I celebrated with steak from the local charcouterie and some of Bordeaux’s finest red !! 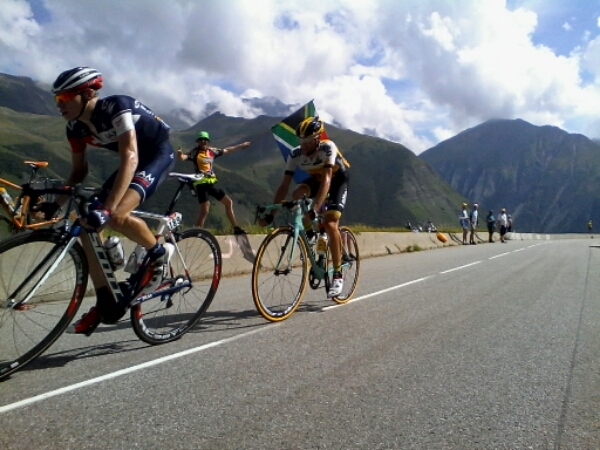 So sad that Louis Meintjes could not finish the tour!!! The Alpe Du Huez – simply majestic Du Huez Du Huez!! !